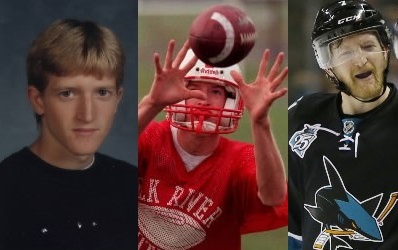 Was Sharks D Paul Martin as good of a Minnesota high school athlete as Joe Mauer? Mauer’s high school exploits at Cretin-Derham Hall are the stuff of legend, and for good reason. That said, a case can be made that Paul Martin had a prep career of similar substance at Elk River. Joe Mauer’s high school exploits at Cretin-Derham Hall are the stuff of legend, and for good reason. Mauer was, of course, a tremendous baseball player — striking out just once in his entire prep career before being chosen by the hometown Twins with the No. 1 overall pick in the 2001 draft. He was a great high school quarterback and had a full ride waiting for him at Florida State had he not decided to play baseball. And Mauer was also an excellent basketball player on a Cretin team that reached the state tournament his senior season. In the state semifinals — an 88-82 loss to Osseo — Mauer, a guard, had 25 points, eight rebounds and five assists. He was later named to the Class 4A all-tournament team. In the modern era of athletes, that’s a pretty hard 1-2-3 punch to top, especially considering the success Mauer went on to have in the majors (three batting titles and an MVP award). That said, there is a case to be made that Sharks defenseman Paul Martin — a contemporary of Mauer in terms of era — is also in the same discussion in terms of how good of a prep athlete he was. I started digging into this after some incredulity surfaced during Pittsburgh’s Game 1 win over San Jose last night, when Pierre McGuire casually mentioned that Martin was among the all-time great wide receivers in Minnesota high school history. It turns out McGuire wasn’t using as much hyperbole as some of us thought — and that Martin’s athletic talent branches in more directions than I remember. *Martin, a 2000 Elk River graduate (one year before Mauer) was of course a standout hockey player. He was Mr. Hockey and the Star Tribune’s Metro Player of the Year as a senior. He went on to play for the Gophers and was the 62nd overall pick of the Devils in 2000. He made his NHL debut in 2003 and has logged nearly 800 regular-season games in the league. *As a football player, he was arguably just as impressive — if not more so. According to the Star Tribune’s archives, Martin was a gifted wide receiver who graduated with the state career records for receptions (189) and yards (3,009). The two Star Tribune all-Metro wide receivers his senior year: Martin and future NFL standout Larry Fitzgerald Jr. of Holy Angels. *As a baseball player, he was no slouch, either. Martin was a .354 hitter entering the playoffs as a senior. His final numbers aren’t listed, but that does add to his athletic legend. Basketball coaches were just as eager to have Martin on their team as Elk River’s hockey coaches. But the ice won out, in part because — as Martin would say as a high school senior — he figured he had a better chance to have a future in hockey. So he was basically awesome at arguably the four biggest boys’ high school team sports (at least in the late 1990s). He quite possibly could have been a college football player and — who knows — could have perhaps been a college basketball player, at least, had he stayed on that path. I’m not sure that quite puts Martin on par with Mauer, but it sure puts him in the conversation. At the very least, he was a far more accomplished multi-sport athlete than I remember.